Opium Moon's self-titled debut album has been honored with a Grammy award for Best New Age Album. Check out the full record HERE. OPIUM MOON RECEIVES GRAMMY NOMINATION! Opium Moon's self-titled debut album has received a Grammy award nomination in the Best New Age Album category! This music is straight from the hear and I would love for you to Check It Out! "CARAVAN" VIDEO PREMIERES ON NPR MUSIC! Please check out the new video for the single "Caravan" from my band Opium Moon. It was premiered today on NPR! You can watch the video below, and read their glowing review HERE. OPIUM MOON DEBUT ALBUM OUT NOW! We're so excited that our debut self titled album came out July 15 and debuted at #6 on four Billboard Top 10 charts, including World music and Classical!" 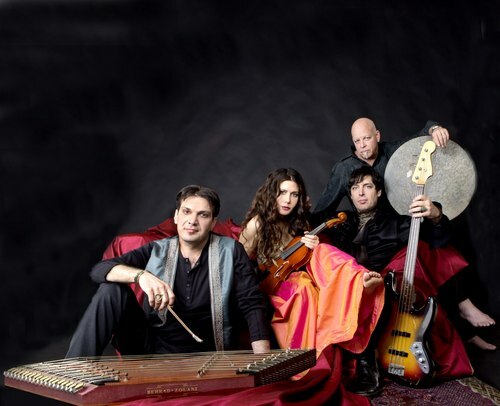 Opium Moon is Kama Sutra music...a sensual and groovy collaboration of master musicians LiliHaydn on Violin/Voice, Hamid Saeidi on Santoor (Persian hammered dulcimer) and voice, MB Gordy on ancient percussion, and Itai Disraeli on fretless bass. We come from the corners of the world—Israel, Iran, and the US—-making peace through harmony. "Opium Moon produces a sound that’s biblical yet carnal...creating a sound like something born from the underlying forces of sensuality."